A Letter from the CEO of AlfredCamera - Announcements - Alfred Center | get the most out of the best home security app! Today we’re excited to unveil a new, geometrically composed logo for the AlfredCamera app. It’s not just about a fresh look, but also about the new spirit of AlfredCamera. Here, we’re going to explain why we revised it. We loved the old Papa Alfred on the logo. He was a friendly butler protecting your home well. We know many of you may feel the same. He was unique and made Alfred stand out from other home security camera apps. However, his uniqueness also causes issues. Because Papa Alfred was inspired by the well-known figure from a superhero story, we realized that we needed a change in order to avoid confusion as we introduced our product to more and more users. We expect our brand identity to be scalable across the world. Moreover, Papa Alfred ultimately wasn’t a self-descriptive logo for a home security app. Our aesthetic needed to match our product’s purpose, so we changed the logo to align with this vision. The original logo is about us, the butler, while the new one focuses on home, the place our users care about. 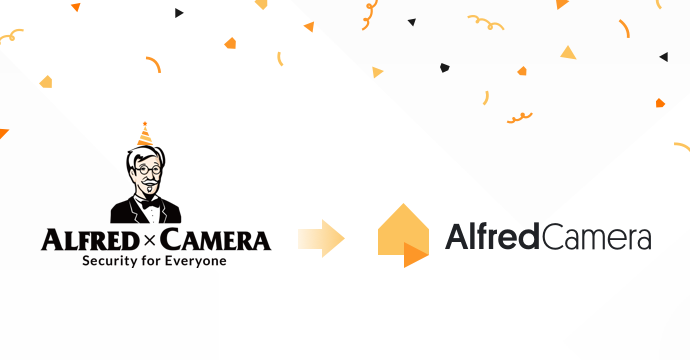 The release of the new logo reveals a new era of user-centered culture for AlfredCamera. Some old friends might find innumerable improvements besides visual adjustments. This is just the beginning. In fewer words, the new logo is descriptive, user-centered, and recognizable. Hope you like the new AlfredCamera.